When we think of trick-or-treating, the first thing that comes to mind is the excitement from getting to collect a bag full of your favorite candy. But that may not be the case for kids who have food allergies. One organization is on a mission to change that and make Halloween trick-or-treating equally exciting for those who can’t share in the enjoyment of the tasty treats. 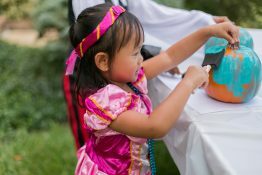 In 2014, the Food Allergy Research & Education (FARE) launched the Teal Pumpkin Project — an intuitive that focuses on offering non-food treats, such as glow sticks or small toys, instead of candy, so all children can go home with something exciting. The project has become a worldwide movement, and in 2015, all of the 50 U.S. states and 14 other countries participated. Get creative! Think of some small non-food treats that may get kids excited. Once you’ve supplied the goodies, paint a pumpkin in teal color and place at your front door to indicate that you have non-candy treats for kids. You may also want to download and print one of their free posters that explains why your pumpkin is this unusual color. You can share in the comments section below your favorite ideas for non-candy goodies that would make for a great Halloween treat! i think this is a great idea because there is a lot of kids who have allergies to a lot of food and cannot have certain candies so its a good idea to hand out little trinkets. I think it is a good idea because some young kids on Halloween can’t have any good chocolate. Which I like all kinds of chocolates. 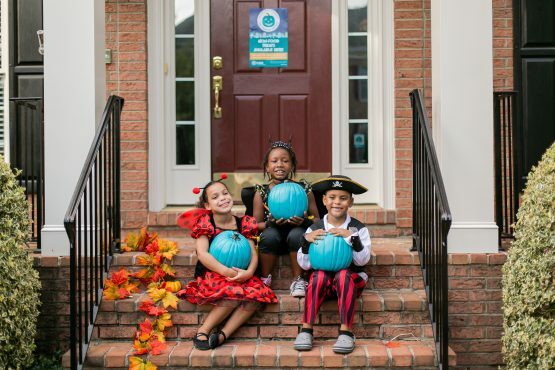 I think it is a good idea for the Teal Pumpkin Project because some young kids can’t have most of the good candy on Halloween, and Halloween isn’t fun if you can’t have a bunch of good candy. I think the teal pumpkin project is a good idea because for people like me who have allergys need to be aware of what we eat. Espicailly on Halloween. I think it would be a good idea if you put both out for people how don,t have allergys. I have alergic reactions so cout me in. I think the teal pumpkin project is a good idea since there are people who have food allergies and they can’t eat much. I think the teal pumpkin is a great idea but to make it fair why don’t you put both out? Candy and the fun prizes?